1. Gently simmer about an inch of hot water in a saucepan. Rest heatproof bowl in mouth of saucepan and melt chocolate and coconut oil in bowl. 2. Once melted, pour 1 tbsp chocolate mixture into each paper cup holder and use the back of the spoon to spread the chocolate around the sides. Delicately shake cups to ensure smooth coverage across the bottom. 3. Freeze cups for 10 minutes. 4. Meanwhile, put ingredients for caramel filling into blender and blend until smooth. 5. 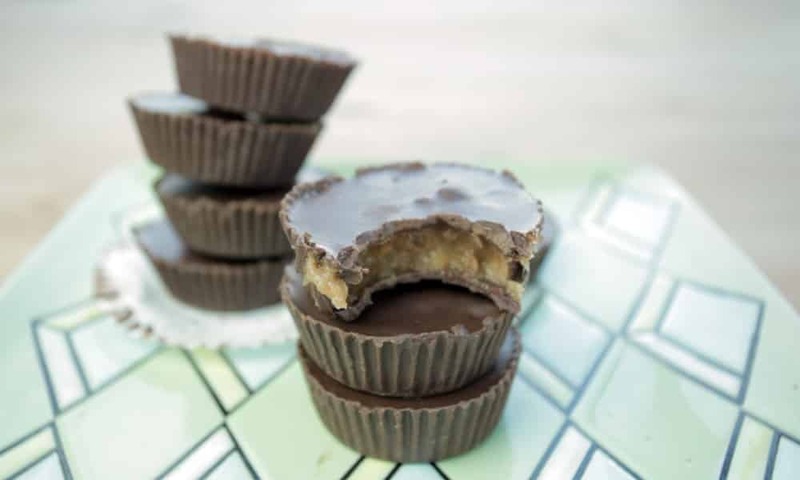 Remove cups from freezer and put 1.5 tsp caramel into each cup ensuring the top is as smooth as possible. 6. Cover caramel with 1 tbsp chocolate and gently shake cups until chocolate layer is evenly spread. 7. Freeze for 15 minutes. 8. Remove cups from freezer and peel away the paper cup holders.